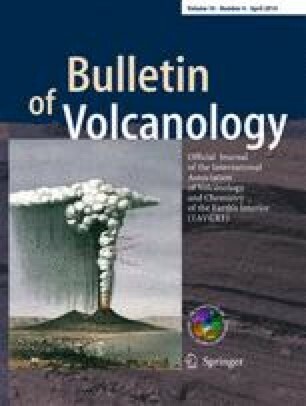 The well-documented 1883 eruption of Krakatau volcano (Indonesia) offers an opportunity to couple the eruption’s history with the tsunami record. The aim of this paper is not to re-analyse the scenario for the 1883 eruption but to demonstrate that the study of tsunami deposits provides information for reconstructing past eruptions. Indeed, though the characteristics of volcanogenic tsunami deposits are similar to those of other tsunami deposits, they may include juvenile material (e.g. fresh pumice) or be interbedded with distal pyroclastic deposits (ash fall, surges), due to their simultaneity with the eruption. Five kinds of sedimentary and volcanic facies related to the 1883 events were identified along the coasts of Java and Sumatra: (1) bioclastic tsunami sands and (2) pumiceous tsunami sands, deposited respectively before and during the Plinian phase (26–27 August); (3) rounded pumice lapilli reworked by tsunami; (4) pumiceous ash fall deposits and (5) pyroclastic surge deposits (only in Sumatra). The stratigraphic record on the coasts of Java and Sumatra, which agrees particularly well with observations of the 1883 events, is tentatively linked to the proximal stratigraphy of the eruption. The online version of this article (doi: 10.1007/s00445-014-0814-x) contains supplementary material, which is available to authorized users. This work was funded by French ANR (Agence Nationale de la Recherche) program “Young Scientist” 2008–project VITESSS (Volcano-Induced Tsunamis: Sedimentary Signature and numerical Simulation) whose leader was Raphaël Paris. The authors are also grateful to Jean-Marc Hénot (SEM, Clermont-Ferrand), Marc Diraison and Martine Trautmann (AMS and grain size analysis, Strasbourg), Claudia Maxcia Setjaatmadja, Eko Yulianto and Brian Atwater (for giving unpublished manuscript on coral boulders), and David Dublanchet (for building the kml files). The authors thank Scott Bryan, Adam Switzer and an anonymous reviewer for their careful reviews, as well as Steve Self and James White. This is Laboratory of Excellence ClerVolc contribution n° 90.